1 » The word “dominate” is thrown around a lot, but that is exactly what No. 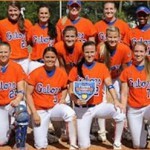 6/5 Florida Gators softball (39-7, 17-4 SEC) did Wednesday evening, shutting out the North Florida Ospreys (23-27) 22-0 and 8-0 in a doubleheader at Katie Seashole Pressly Stadium in Gainesville, FL. The Gators won each game in five innings, hitting seven total home runs (six in the first game – tying UF single-game record) and scoring 30 runs. The 22 runs that crossed home plate in the first game of the series (14 in the third inning alone) set a school record. Wins were achieved by junior Stephanie Brombacher (26-5), who began a no-hitter with five strikeouts in three innings, and freshman Ensley Gammel (12-2), who struck out six and only gave up three hits. Senior outfielder Francesca Enea (18), freshman first baseman Brittany Schutte (14), junior OF Kelsey Bruder (10), junior catcher Tiffany DeFelice (7), senior third baseman Corrie Brooks (8) and freshman OF Kelsey Horton (4) hit the first six bombs, with DeFelice (8) adding a second in the late game. Schutte’s moon shot also broke Florida’s freshman home run record, last set in 2008. 3 » Also increasing its talent level is Florida’s track and field team, which added a commitment from Luc Lawrence (Fort Walton Beach, FL), Lawrence, who can run both track and cross country, began running in eighth grade and caught the eye of cross country coach Todd Morgan almost immediately. 4 » As OGGOA first reported on Twitter early Wednesday, Denver Broncos quarterback Tim Tebow officially had the top selling jersey in the month of April according to sales figures from NFLShop.com. Tebow’s new Broncos jersey was only available for eight days of the month (he was drafted on April 22), yet it easily surpassed jersey sales for new Washington Redskins QB Donovan McNabb, who was traded away from the Philadelphia Eagles on April 4 and came in second overall on the list. Softball isn’t really the breading ground for petite women huh?